Notice that there's been no talk yet of a funeral for Michael Brown. That's because his body is still being "reviewed" and examined. An initial autopsy was performed by the St. Louis County medical examiner. Then, just recently Michael M. Baden, renowned former chief medical examiner for the City of New York, performed an additional autopsy. 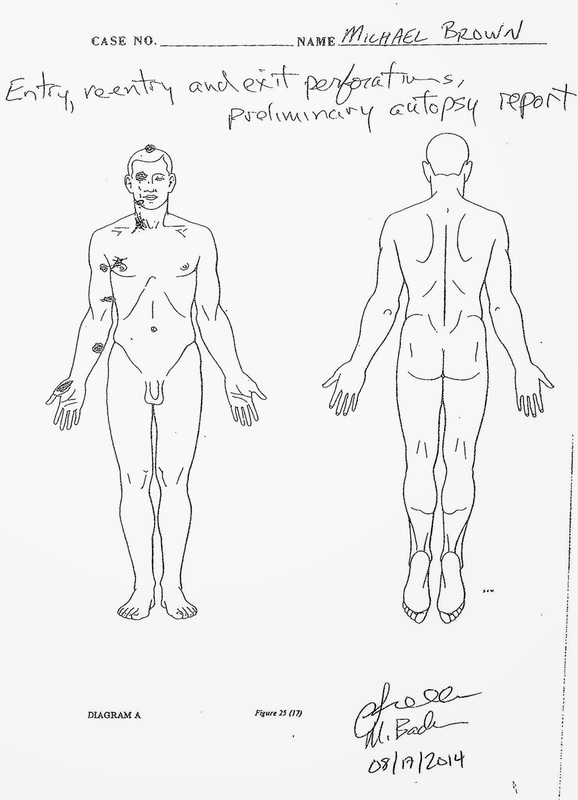 Notably, The Times released a sketch (seen above) with Baden's and his assistant's handwritten annotations of the "entry, reentry and exit perforations" in the autopsy report that they prepared. Baden, by the way, is widely respected in his field. He reviewed the autopsies of JFK and MLK, and he has conducted more than 20,000 autopsies. Baden's services for the autopsy were retained by the Brown family attorney, Benjamin L. Crump, who was also the family attorney for Trayvon Martin's family. Yesterday, Eric Holder announced that the Justice Department will also perform an autopsy on Brown's body. Baden noted in his interview with The Times that it is unusual for three different autopsies to be performed. Brown's family distrusts the local officials, so they are in favor of the additional examinations and thus delaying the funeral services. Although countless commentators rightly draw parallels between Trayvon Martin and Michael Brown, an important difference involves the presentation and examination of their bodies. Martin was killed on the evening of February 26, 2012, and the funeral was 6 days later on March 3. National coverage for Martin occurred after the funeral. By contrast, the coverage for Brown, who was killed on August 9, began immediately -- thanks to the grassroots. We knew that Martin was shot and killed. Conversely, with the Baden report, we know details about Brown. We know that he was shot 6 times; we know "some of the bullets entered and exited several times, including one that left at least five different wounds;" and we know (Lord, Lord) that "one of the bullets shattered Mr. Brown’s right eye, traveled through his face, exited his jaw and re-entered his collarbone." Only now, after Baden's report, do you realize just how innocent we were having relatively few details and annotations concerning the body of Trayvon Martin.